﻿ HuntingNut » Forums » Hunting » Big Game Hunting » What Defines Bullet Expansion? Posted: Sat Aug 03, 2013 1:53 pm Post subject: What Defines Bullet Expansion? 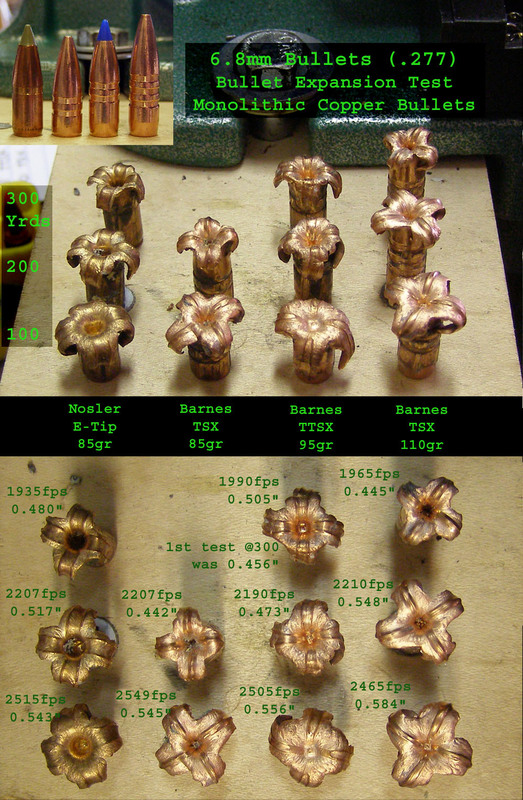 An analysis of all-copper, monolithic bullet performance. I have been conducting terminal performance tests with quite a few .277 bullets for the 6.8mm SPC as well as the .270 Win. I’m hunting with the 6.8mm most of the time but still use the .270 Win when I need more reach and for elk. The minimum velocity required for bullet expansion is an important factor for me when choosing a bullet for the 6.8 to use out to 300 yards or the .270 out to 500 yards (there are plenty of shot opportunities at these ranges in Texas and New Mexico if you practice for it). A hunting bullet still needs to expand at these longer ranges in order to transfer their energy and not over-penetrate. Here is a collective picture showing all of the monolithic 6.8 bullets tested. The 85gr TSX has not tested yet at 300 yards because the bullet has exhibited limited expansion and over penetration at 200 yards. Posted: Sat Aug 03, 2013 1:54 pm Post subject: Re: What Defines Bullet Expansion? Here is a graph comparing their velocities, momentum, and kinetic energy. Average muzzle velocities, BCs, and bullet lengths are below and shot from an 18” barrel with a 6.8mm SPC II chamber. Caution - these loads worked in my rifles but this is no guarantee that they will work safely in yours. Posted: Sat Aug 03, 2013 2:07 pm Post subject: Re: What Defines Bullet Expansion? Manufacturers typically advertise a minimum velocity at which a bullet type will open up or mushroom. I have found that bullet velocity is not a consistent parameter in determining when a bullet starts to open up, e.g., the Barnes 110gr TSX opens up and has greater expansion at lower velocities than the 85gr TSX even though they both have the same expansion cavity design with an advertised 2100 fps minimum velocity for expansion. To better understand what is occurring on impact, bullet expansion was charted with respect to velocity, momentum, and then kinetic energy to see if there was any correlation of data. When charting bullet expansion compared to velocity and momentum, there was no correlation. 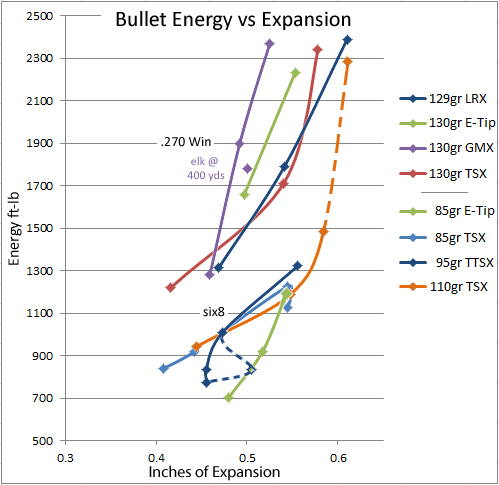 When expansion was charted with respect to the bullet’s kinetic energy, there was positive correlation and the 85gr and 110gr TSX matched each other. 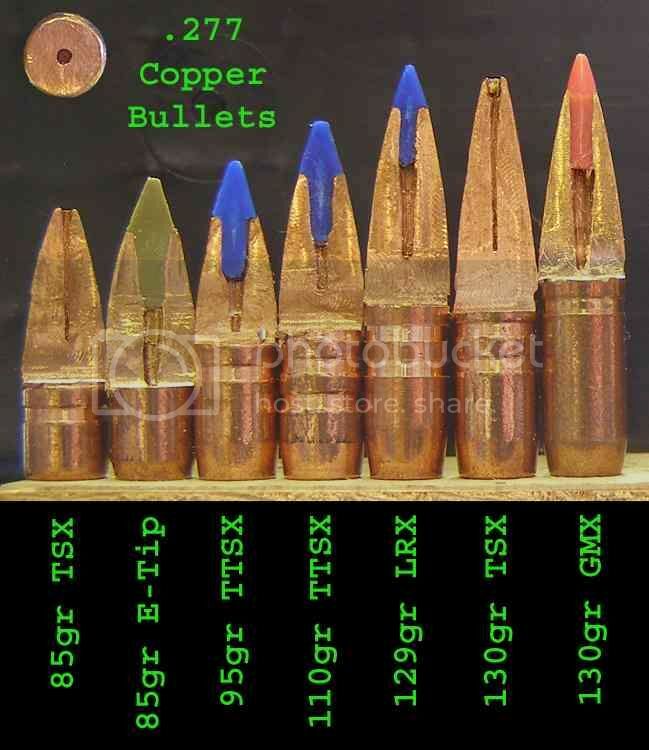 As seen in the charts below, expansion of monolithic copper bullets is determined by the bullet’s kinetic energy on impact not velocity, e.g., heavier bullets at lower speeds can out expand lighter bullets of the same caliber at faster speeds. This now seems obvious after looking at the data – work has to be expended to peel open and fold back the pedals of a solid copper bullet. Work is energy (1/2 mass * velocity ^2). Instead of one chart showing all the compiled data up front, 3 charts are used to best show the data and build on the observations. Below is the first chart completed which compares just .277 Barnes TSX bullets. 6.8 tests were conducted at 100, 200, and 300 yards. Bullet tests with the .270 Win were at 100, 300, and 500 yards. This has been an enlightening exercise and shows why the 85gr TSX has a limited range. Note, the 85gr TSX was tested twice with two different powder weights during load development. o The 85gr and 110gr TSX are designed for the 6.8mm and the 130gr TSX for the .270. Note that the 130gr expansion curve parallels the 85gr/110gr TSX but the 130gr TSX needs about 40% more kinetic energy for the same expansion. o As seen in the collective picture above, the 110gr TSX fired from a 6.8 with an impact energy of 1500 ft-lbs (100 yards) has expanded to the bottom of the expansion cavity. When fired from a .270 Win (2300 ft-lbs at 100 yards), the bullet expands well beyond the bottom of the expansion cavity. Just over 0.6” seems to be the practical expansion limits of Barnes .277 all-copper bullets. If you want more expansion, you will need to go to a larger caliber. o To achieve a minimal expansion of 0.4”, at least 800 ft-lbs of energy is required for 6.8mm-designed TSX bullets. The 85gr TSX achieves this around 200 yards while the 110gr TSX will have the same expansion around 300 yards. The 85gr TSX has a higher muzzle velocity but its low BC [0.246] causes the bullet to decelerate more rapidly resulting in less energy and reduced expansion. Posted: Sat Aug 03, 2013 2:14 pm Post subject: Re: What Defines Bullet Expansion? Newly Designed 6.8mm Bullets with Ballistic Tips. The chart below has the test data add for the Nosler 85gr E-Tip and Barnes 95gr TTSX which are tipped 6.8mm bullets designed specifically to open up at lower velocities. 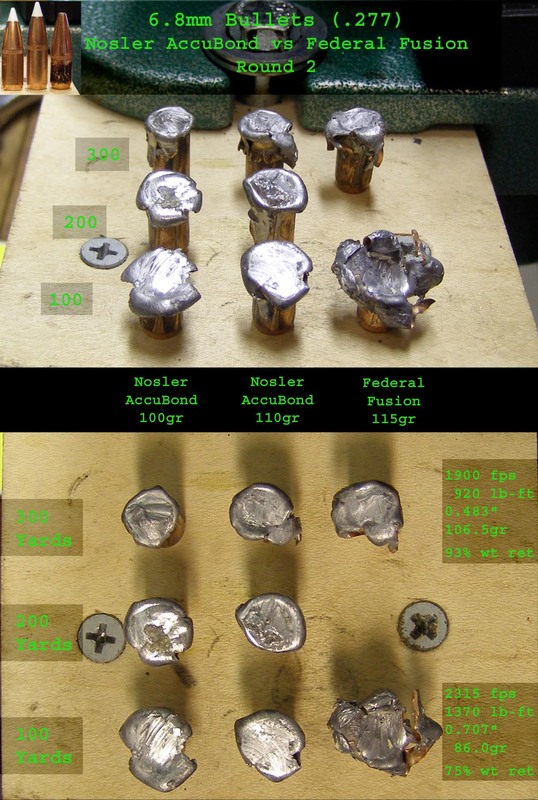 Posted: Sat Aug 03, 2013 2:15 pm Post subject: Re: What Defines Bullet Expansion? o Both bullets out expand the TSX bullets at lower velocities and energy states . A point for consideration - the data suggests that expansion will occur at energy levels below 700 lb-ft (beyond 300 yards) which is less energy than what many recommend to humanly harvest deer. o The Nosler 85gr E-Tip out-expanded the Barnes bullets below 1200 ft-lbs of energy and particularly the 85gr TSX at ranges greater than 100 yards. The E-Tip’s expansion advantage is achieved even though the E-Tip’s copper-zinc alloy is harder than the Barnes’ pure copper bullets. This has to be due to the E-Tip’s massive expansion cavity hidden behind its ballistic tip. Below is a cross-section of .277 monolithic bullets. The 85gr E-Tip and 95gr TTSX have the largest expansion cavities. The amount of expansion the TSX bullets achieve is impressive for their small cavity size. o The 95gr TTSX does hold an energy advantage over the 85gr E-Tip that equates to about 75 yards. o The 95gr TTSX does expand better than the TSX bullets at lower energy states until the expansion becomes full-bodied, e.g., when the copper web emerges between its four pedals. Then the data suggest its expansion is similar to Barnes’ 6.8mm TSX bullets. Note in the picture above that the 95gr TTSX expanded to the bottom of its expansion shot from a 6.8 at 100 yards. o A small point. Two 95gr TTSX bullets were tested and recovered at 300 yards. The bullet that expanded above 0.5” at 300 yards (850 ft-lbs, dotted-line) was that wide because two of the four pedals did not fold back along the bullet’s body like the other recovered TTSX bullets. When expansion was measured across the other two pedals, it was similar to the other bullet recovered at 300 yards that expanded to 0.456”. 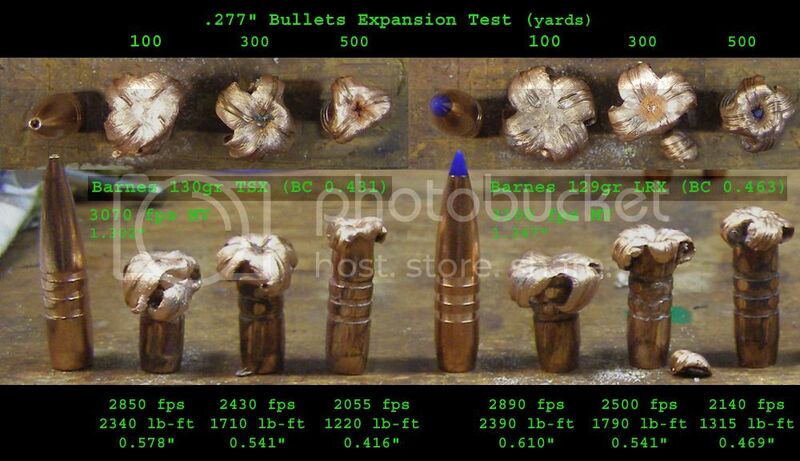 Posted: Sat Aug 03, 2013 2:17 pm Post subject: Re: What Defines Bullet Expansion? 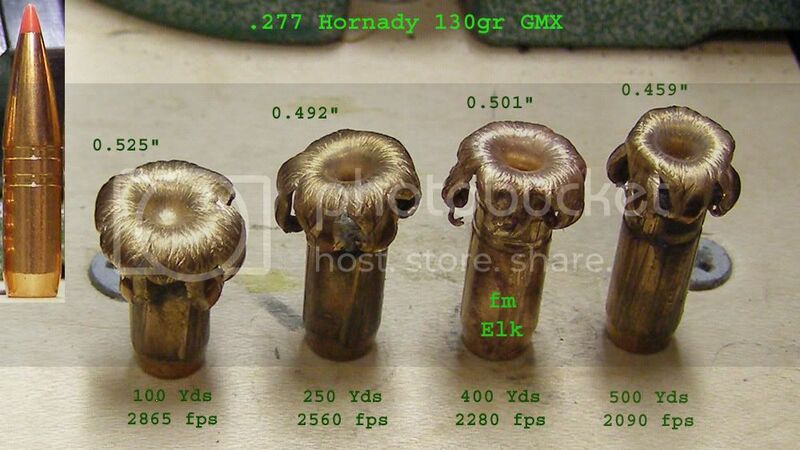 Here is the charted data with the Barnes 129gr LRX, Hornady 130gr GMX, and Nosler 130gr E-Tip added. All were fired from a .270 Win. They were tested at 100, 300, and 500 yards. Note, the E-Tip not tested yet at 500 yards and I just started load development and am working up. Posted: Sat Aug 03, 2013 2:18 pm Post subject: Re: What Defines Bullet Expansion? o All three bullets are designed to expand at energy levels greater than those achievable in a six8. Thus, if fired from a six8, they would not expand as well resulting in limited or no expansion and over-penetration. This has been the typical result with several other .277 bullets that are designed for the velocities in the .270 Win range, e.g., Hornady 110gr HP, Barnes 110gr TTSX, and Berger 130gr and 140gr VLDs. These bullets are still good for target shooting in the six8 but don’t expect consistent or effective results if they are used for hunting. o The softer copper Barnes 129gr LRX and 130gr TSX expanded to larger diameters at higher energy states than the tipped 130gr GMX and E-Tip bullets which are made from a harder 95% copper, 5% zinc alloy. o The LRX provided superior expansion achieving the largest expansion of any .277 monolithic bullet tested, 0.611” well over doubling its size. To test the LRX’s advertised minimum opening “velocity” of 1600, testing would have to occur out to 800 yards (800 ft-lbs) or I need to develop a light load. Note, if shot with a lower muzzle velocity, the bullet’s stability will be less which may have a negative effect due to its length. Pictures of the recovered LRX and TSX bullets can be seen at this link. o A GMX recovered after over 30 inches of penetration in a cow elk compared well with GMX bullets recovered from the bullet trap. This was a 400 yard shot at 8500’ MSL which was 200 fps faster on impact than if the bullet was shot at sea level. This resulted in higher impact energy similar to a 300-yard impact. o I had planned to test modified 130gr E-Tips in a six8 with the assumption its expansion would provide similar results as the 85gr E-Tip. However, this data suggests the 130gr E-Tip performance will be disappointing at the lower velocities achieved with heavier bullets in a six8. Posted: Sat Aug 03, 2013 4:25 pm Post subject: Re: What Defines Bullet Expansion? Slim buddy, awesome study as this should be written as an article. Posted: Sat Aug 03, 2013 5:36 pm Post subject: Re: What Defines Bullet Expansion? Thanks, gelandangan. I should have thought of doing an article but there are a couple of disadvantages the biggest one being when the site software gets updated, the articles get dumped and have to be resubmitted. I need to do analysis for lead-core bullets that expand but I don't think the data will correlate as nicely. Also, I've also come to the conclusion that the kinetic energy that determines penetration is not the bullet's weight on impact but its retained weight. I just recovered a 150gr bullet with a retain weight of 55gr that only penetrated as far as my .223 hunting bullets. It's hard to beat the monolithic bullets for expansion and penetration. Posted: Sun Aug 04, 2013 12:11 am Post subject: Re: What Defines Bullet Expansion? great info as always slim. Posted: Sun Aug 04, 2013 1:15 pm Post subject: Re: What Defines Bullet Expansion? Gelandangan got me motivated to see if expansion of lead-core bullets like the AccuBond and Fusion MSR/GD would hold true to the paradigm that energy defines how much they will expand. At first the data didn’t make much sense. I have always recorded maximum expansion of the recovered bullet. The monolithic bullets are very symmetrical but that is not the case with the lead-core bullets, especially the Federal Fusion family. When I averaged bullet expansion based on the widest and narrowest side of the mushroom, the data correlated surprisingly well. So I have added a 4th chart with the Nosler 100gr and 110gr AccuBonds (gray) and the Federal Fusion 90gr Gold Dot, 115gr MSR, and 120gr MSR (purple). I did it slightly different and kept the bullet family a like color and labeled the specific bullet on the chart. Yes, the chart is a bit cluttered but it is worth a peek. Caution - this load worked in my rifle but this is no guarantee that it will work safely in yours. Posted: Sun Aug 04, 2013 7:22 pm Post subject: Re: What Defines Bullet Expansion? o The 100gr AccuBond always hit harder inside 200 yards. Now we know its design is slightly different than the 110gr AB and the 100gr expands more at the higher energy levels. Both bullets expand the same at lower energy levels. Here is a "group" picture of the AccuBonds showing terminal performance. Posted: Sun Aug 04, 2013 7:28 pm Post subject: Re: What Defines Bullet Expansion? o The Federal Fusion bullets may have similar lead-cores and construction but they all perform differently. I would guess their nose shape and copper jacket design are responsible for the difference. o The Federal 115gr MSR expansion is very similar to the Barnes TSX but has the potential for great expansion at higher energy levels. It will be interesting to see this bullet’s performance when it is available as a component for handloaders. o The Federal 90gr Gold Dot’s expansion is very similar to the 85gr E-Tip just slightly larger. I think their curves would match better except the Gold Dot recovered at 200 yards had one of its 5 pedals that didn’t fold back. The 90gr GD’s expansion is well controlled, does not shrink much as energy decreases, and is well matched for the 6.8mm SPC. All the Fusion MSR/GD terminal performance results can be seen in this image. Posted: Sun Aug 04, 2013 10:42 pm Post subject: Re: What Defines Bullet Expansion? those fusions look good to me,sure have made a mess of themselves.